In former times when maps were rare it was usual to make a formal perambulation of the parish boundaries on Ascension Day or during Rogation week. The priest of the parish with the churchwardens and the parochial officials headed a crowd of boys who, armed with green boughs, usually birch or willow, beat the parish boundary markers with them. Sometimes the boys were themselves whipped or even violently bumped on the boundary-stones to make them remember. The object of taking boys is supposed to ensure that witnesses to the boundaries should survive as long as possible. Priests would pray for its protection in the forthcoming year. Hymns would be sung, indeed a number of hymns are titled for their role, and many places in the countryside bear names such as 'Gospel Oak' testifying to their role in the beating of the bounds. In England the custom is as old as Anglo-Saxon days, as it is mentioned in laws of Alfred the Great and Athelstan. It is thought that it may have been derived from the Roman Terminalia, a festival celebrated on 22 February in honour of Terminus, the god of landmarks, to whom cakes and wine were offered, sports and dancing taking place at the boundaries. Similar practices, of pagan origin, were brought by the Vikings. A parish-ale or feast was always held after the perambulation, which assured its popularity, and in Henry VIII's reign the occasion had become an excuse for so much revelry that it attracted the condemnation of a preacher who declared "these solemne and accustomable processions and supplications be nowe growen into a right foule and detestable abuse." Beating the bounds had a religious side in the practice which originated the term Rogation, the accompanying clergy being supposed to beseech (rogare) the divine blessing upon the parish lands for the ensuing harvest. This feature originated in the 5th century, when Mamertus, Archbishop of Vienne, instituted special prayers and fasting and processions on these days. This clerical side of the parish bounds-beating was one of the religious functions prohibited by the Royal Injunctions of Elizabeth I; but it was then ordered that the perambulation should continue to be performed as a quasi-secular function, so that evidence of the boundaries of parishes, etc., might be preserved. Bequests were sometimes made in connection with bounds-beating. For example, at Leighton Buzzard on Rogation Monday, in accordance with the will of Edward Wilkes, a London merchant who died in 1646, the trustees of his almshouses accompanied the boys. The will was read and beer and plum rolls distributed. A remarkable feature of the bequest was that while the will is read one of the boys has to stand on his head. In our parish it is the custom that the boundaries are perambulated every seven years. The event is now enjoyed by many people, young and old and a large number usually participate. 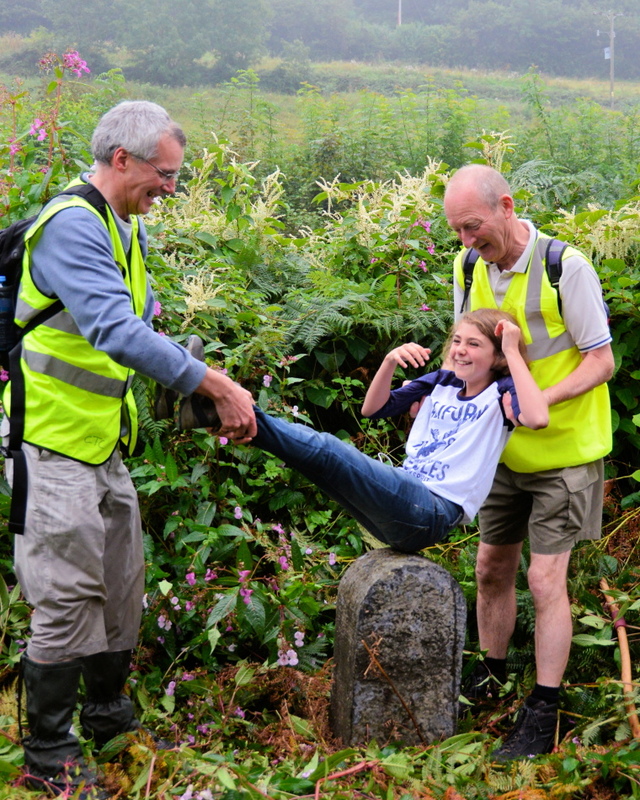 The event takes a great deal of organising, particularly from a health and safety point of view as our boundaries in places either cross or run along the major trunk routes (A38 and A380). The custom is that the boundary (of some 22 miles on the OS map) is walked in one day in a clockwise direction starting at Stokelake Meadow, alongside the Teign. 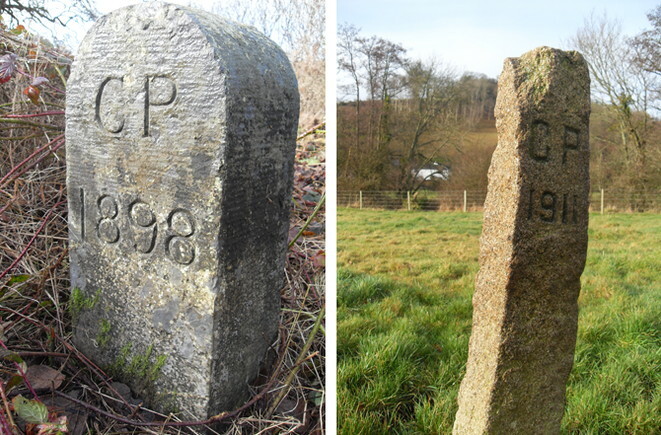 There are a total of ten existing boundary stones, dating mainly from 1898 and 1911 with a couple being much older. They are generally inscribed 'CP' (civil parish). Apart from the River Teign, the boundary follows Bramble Brook for much of its length (to the north of Whiteway), then a line across Haldon and the racecourse to a point alongside the A380 not far from the top of Telegraph Hill. 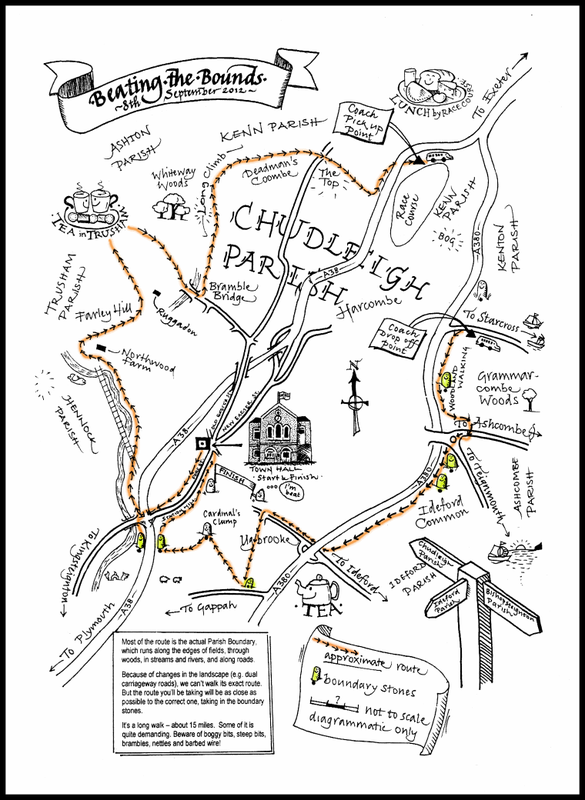 From there the boundary runs roughly south to Ideford Common, thence down to Ideford Arch, then along a short section of Gappah Lane and into Ugbrooke Park. Out of the park toward Winstow the line then passes across the top of Shepherd's Hill and back down to Stokelake Meadow (crossing the busy Exeter-Plymouth dual carriageway). Due to the constaints of modern conditions – e.g. much of the actual parish boundary is on private land or otherwise inaccessible and for safety, participants are bussed from the racecourse to Grammarcome Wood to avoid the A380 dual-carriageway – the actual walking distance nowadays is about 15–16 miles. Left: Stokelake Meadow Right: Lyneham Meadow. A custom emanating from the 1934 perambulation was to provide a souvenir to those who had participated. Initially inscribed mugs, then ashtrays and then commemorative plates. 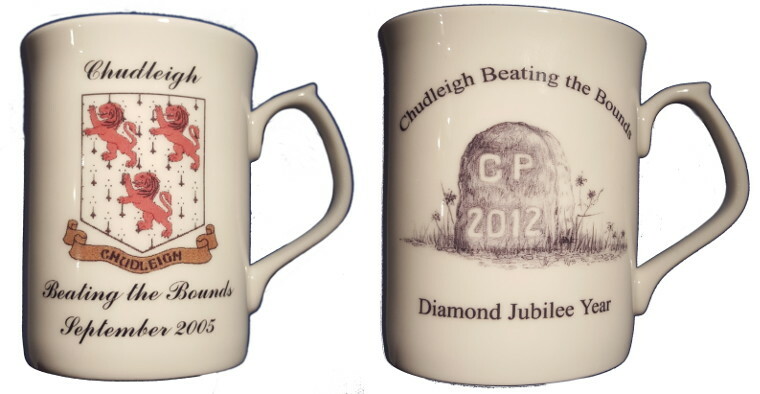 The souvenir in recent times has reverted to mugs, depicting such things as the three lions town crest, the parish church and the town hall. In recent years, participants also receive a certificate. Many of these souvenirs are on public display within the Town Hall. The Beat for 2012 took place on Saturday 8 September under clear skies and saw the number of participants almost reach the 200 mark, for logistical purpses divided into roughly equal 'A' and 'B' groups. 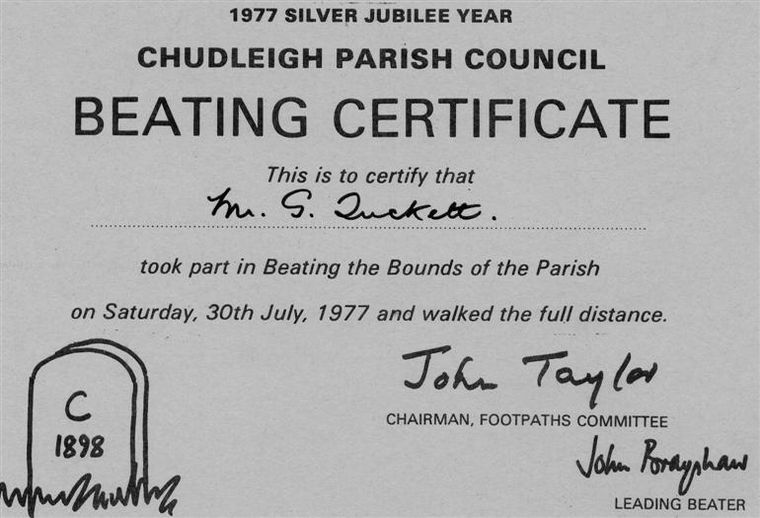 Two individuals came from further afield, Roy Loveys, aged 87 whose first walk was the Beat of 1934 accompanied by his son Chris whose first walk was the Beat in August 1970 which co-incided with his 10th birthday. 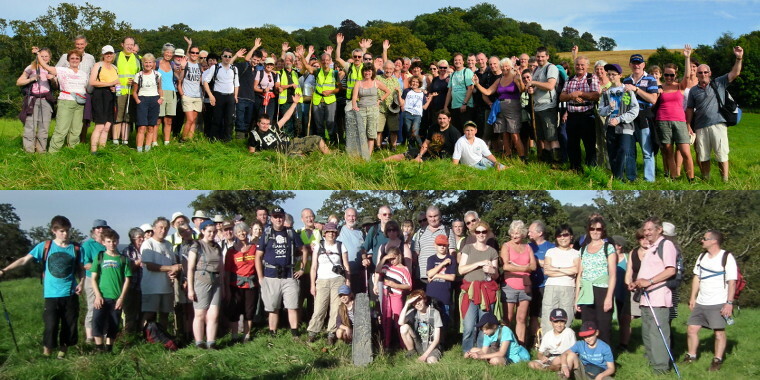 Following registration at the Town Hall the group walked en-masse to the first stone at Stokelake Meadow and after some effort found it amongst undergrowth and almost at the edge of the riverbank of the Teign. From here the party split into the two groups for the remainder of the walk. Refreshments were laid on at Trusham Village Hall in the morning and again at Exeter Racecourse at lunchtime. Coaches ferried the walkers from here over the busy A380 dual carraigeway section and the walk resumed again at Grammarcombe Wood. From there passing two stones at Ideford Common the parties descended a green lane to come out at the afternoon refreshment stop at Thorn's Cottage near Ideford Arch. From here the parties entered the grounds of Ugbrooke Park and with the guidance of Lord Clifford passed two boundary stones before leaving the park under Winstow Arch. From here a short walk to the field at the top of Shepherd's Hill where the final boundary stone was accessed. All those participating were entitled to a signed certificate and a commemorative coffee mug. In this age of equality and diversity, we also use girls to beat on the stones! All those participating were entitled to a signed certificate and a commemorative coffee mug. Following the seven year tradition, the next Beat will take place in the year 2019.